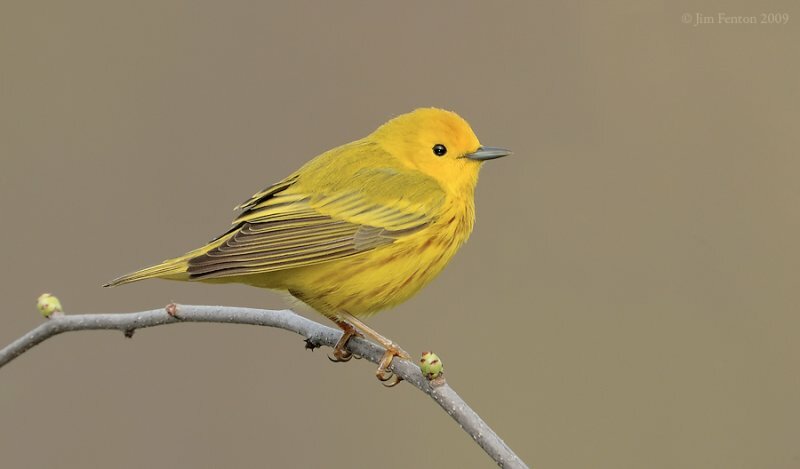 N a recent article Angus Gaines describes so delightfully some of the characteristics of the Yellow Warbler, or Summer Yellow-bird, sometimes called the Wild Canary, that we are tempted to make use of part of it. “Back and forth across the garden the little yellow birds were flitting, dodging through currant and gooseberry bushes, hiding in the lilacs, swaying for an instant on swinging sprays of grape vines, and then flashing out across the garden beds like yellow sunbeams. They were lithe, slender, dainty little creatures, and were so quick in their movements that I could not recognize them at first, but when one of them hopped down before me, lifted a fallen leaf and dragged a cutworm from beneath it, and, turning his head, gave me a sidewise glance with his victim still struggling in his beak, I knew him. His gay coat was yellow without the black cap, wings, and tail which show in such marked contrast to the bright canary hue of that other yellow bird, the Gold-finch. 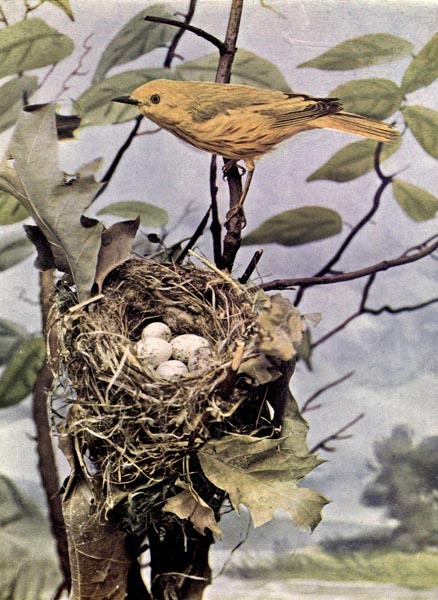 The Yellow-bird builds in bushes, and the nest is a wonderful example of bird architecture. Milkweed, lint and its strips of fine bark are glued to twigs, and form the exterior of the nest. Its inner lining is made of the silky down on dandelion-balls woven together with horse-hair. In this dainty nest are laid four or five creamy white eggs, speckled with lilac tints and red-browns. The unwelcome egg of the Cow-bird is often found in the Yellow-bird’s nest, but this Warbler builds a floor over the egg, repeating the expedient, if the Cow-bird continues her mischief, until sometimes a third story is erected. A pair of Summer Yellow-birds, we are told, had built their nest in a wild rose bush, and were rearing their family in a wilderness of fragrant blossoms whose tinted petals dropped upon the dainty nest, or settled upon the back of the brooding mother. The birds, however, did not stay “to have their pictures taken,” but their nest may be seen among the roses. 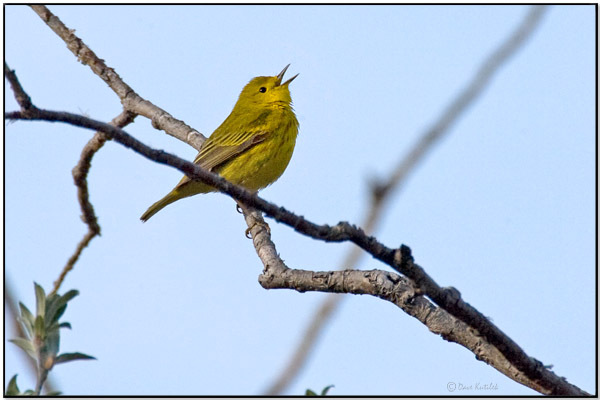 The Yellow Warbler’s song is Sweet-sweet-sweet-sweet-sweet-sweeter-sweeter: seven times repeated. Range—The whole of North America; breeding throughout its range. In winter, the whole of middle America and northern South America. Nest—Built in an apple tree, cup-shaped, neat and compact, composed of plant fibres, bark, etc. Eggs—Four or five; greenish-white, spotted. This Yellow Warbler is now the American Yellow Warbler (Setophaga aestiva) which is the Parulidae – New World Warblers Family. The Yellow Warbler (Setophaga petechia, formerly Dendroica petechia) is a New World warbler species. Sensu lato, they make up the most widespread Setophaga species, breeding in almost the whole of North America and down to northern South America. Other than in male breeding plumage, all subspecies are very similar. Winter, female and immature birds all have similarly greenish-yellow uppersides and are a duller yellow below. Young males soon acquire breast and, where appropriate, head coloration. Females are somewhat duller, most notably on the head. In all, the remiges and rectrices are blackish olive with yellow edges, sometimes appearing as an indistinct wing-band on the former. The eyes and the short thin beak are dark, while the feet are lighter or darker olive-buff. The 35 subspecies of D. petechia sensu lato can be divided into three main groups according to the males’ head color in the breeding season. Each of these groups is sometimes considered a separate species, or the aestiva group (Yellow Warbler) is considered a species different from D. petechia (Mangrove Warbler, including Golden Warbler); the latter option is the one currently accepted by the International Ornithological Congress World Bird List. This entry was posted in Birds, Kid's Section and tagged Birds Illustrated by Color Photography, Birdwatching, Christian, Creation, From The Past, Home School, Kids, Nature, Parulidae, Photography, Warblers, Youth. Bookmark the permalink.